This year my major life goal was to have at least ten hours a month of creative joy. 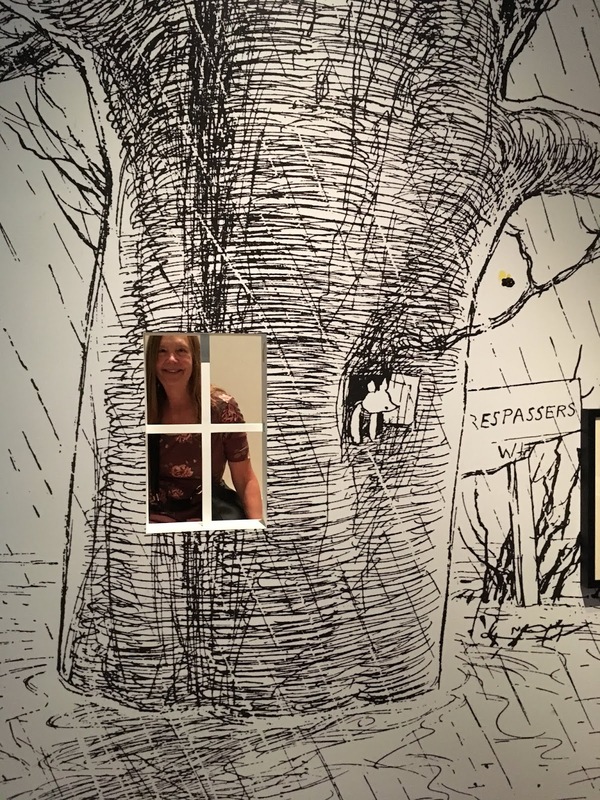 I laid down strict guidelines for what was to count as creative joy: it couldn't just be any old creative or productive activity which gave me happiness in doing it; there had to be an infusion of some extra jolt of rapture. So I couldn't just write for a joyous hour in my little upstairs study in my house. I had to write in a cafe, or with friends, or in nature - or, if at home, I had to light a candle, or at the very least add a dollop of Cool Whip to my usual Swiss Miss hot chocolate, or eat (ooh!) a Pepperidge Farm apple turnover. And I had to log ten hours every single month; I couldn't stockpile extra hours one month against a shortfall in another. This morning I tallied up the results I documented in my faithful little logbook. I logged a total of 146.75 hours of creative joy this year, for an average of 12 hours a month. One month - April - gave me a record 22 hours of creative joy. Only one month (June, where I had a lot of travel and family responsibilities) fell short, with 9.25 - but still, so close. So I pretty much met the goal I set for myself. I have to confess, however, that the goal didn't turn out to be as - well - joyous as I thought it would be. Last year's goal of submitting something somewhere every single month actually brought me more joy than this joy-focused goal did. Even though I feel somewhat embarrassed to admit it, I discovered that product matters more to me than process. I ADORE getting stuff done! That is where I find my greatest satisfaction. Often this past year, I just wanted to skip the extra frills and DO MY WORK. And after a while, the frills themselves became rote: I got used to lighting my candle and adding my Cool Whip to my cocoa - those things didn't feel EXTRA any more, just business-as-usual. That said, I learned that the mere lighting of a candle does indeed add joy to any occasion. And yet . . . when I reviewed my log just now, there were so many hours of creative joy that I remember so fondly. 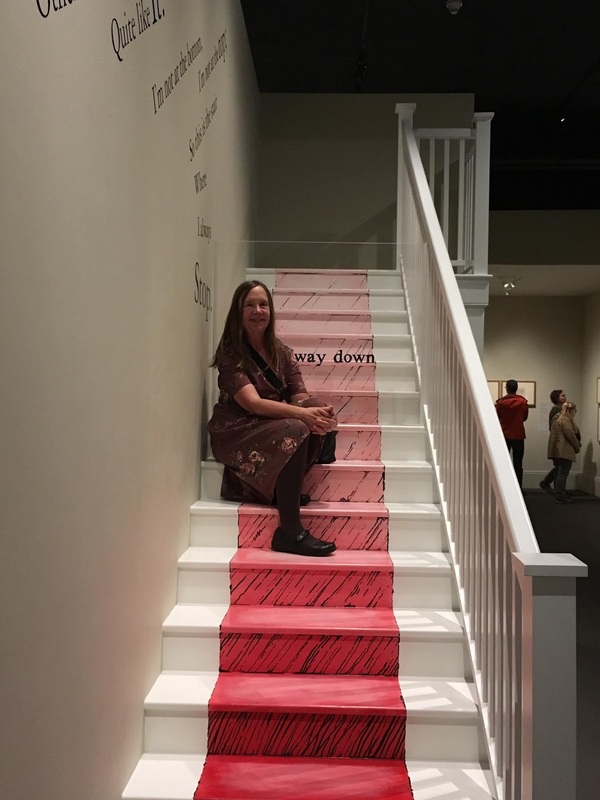 Writing poetry at the Denver Art Museum's show "Her Paris: Women Artists in the Age of Impressionism." Write-ins at Jeannie Mobley's house in Longmont. Taking an amazing class on travel journaling with my creative-joy buddy Kate Simpson. Writing the first page of Vera Vance, Comics Star in Union Station in Denver. Writing on the front porch of Melanie Crowder's cottage, on a rainy afternoon, as we both served as faculty members for the Big Sur in the Rockies writing workshop. Writing at "my table" in the Hollins University library in Roanoke. Writing the first poems for a possible novel-in-verse on the River Walk in San Antonio. Spending a morning at a wonderful coding-for-kids workshop at Stott Elementary School as research for my next book. So: creative joy is a good thing - yes, indeed it is!I'm grateful I had 146.75 hours of it this year, vastly more than I would have had if I hadn't made a commitment to prioritize joy in my life. I'm burning a candle here at my desk at I'm writing this post in the pre-dawn darkness of this next-to-the-last day of the year. I already made my goal for 2019 and will share it in my next post. For now: I hope all of you found joy - creative or otherwise - in 2018. My younger son often gives me a jigsaw puzzle for Christmas. As soon as I open the box, I lose interest in everything else in my entire life. Nothing else matters- NOTHING - as much as sitting hunched over the card table putting those thousand little pieces together. This year he invited me to open that gift early. So on the day before Christmas Eve, that's just about all the two of us did. I stayed up late to work on the puzzle. I got up early to work on the puzzle. In the hours in between I worked on the puzzle. Here it is, in all its splendor: Mont St. Michel, which our family visited on a trip to France fourteen years ago. 1. Even the most daunting puzzle can, and will, be completed by doggedly putting into place piece after piece after piece: one piece at a time. 2. Every single piece is important. Oh, the heartbreak when one puzzle piece turns out be missing and there is that great gaping hole in the picture! Details matter. 3. More often than not, the missing piece does turn up, albeit in some dark and dusty corner of the floor. Be willing to look in unexpected places. 4. Sometimes pieces that look SO MUCH as if they fit together. . . don't. You may not discover this until quite late in the process. Be prepared to revisit even your most confident assumptions. 5. It's truly helpful to get the border done first (my puzzle-whiz sister disagrees on this one!). Once you have a grasp of the overall size and shape, the overall concept of a project, the other pieces do start to fall into place. 6. If you're stuck on one section of a puzzle, take a break from it and turn to a different section. Or just move your chair to look at the problematic section from a different angle, or in different light. 7. Your eyes become trained to detect the slightest variations in shade and hue. It's exciting how much you can see once you set your eyes to seeing. 8. Puzzles are completed faster - and are more fun to do - when you do them with someone else. Yay for collaboration! (I owe more than I can say to my critique partners and editors). 9. 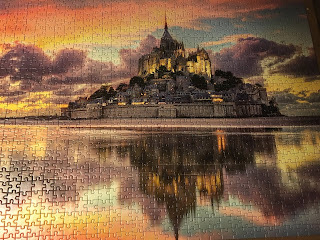 Yes, jigsaw puzzles are an ephemeral accomplishment. But I've written many books that were never published, and most of my published books are now out of print. Life itself is ephemeral. That doesn't mean we shouldn't seize all the joy we can from life while we're here . . . including the joy of working on a Christmas-gift jigsaw puzzle. So of course I went to my little notebook where I figure out all my life problems, and here is what Wise Claudia wrote to Terrified Claudia. CAN I DO IT ALL? Terrified Claudia wrote. Wise Claudia replied: OF COURSE! And then, together, Wise Claudia and Terrified Claudia made a Panic Defusion Plan. 1) I reminded myself that it's amazing and wonderful that I still have my own overwhelming to-do list despite two heartbreaking family tragedies I'm embroiled in. All of these items on my to-do list are MY items, things I'm doing for ME. Which means: I still exist!!! How fortunate I am to have so many projects I'm looking forward to - so much work I truly love to do. 2) I have ALWAYS panicked about getting things done and I have always gotten them done (maybe not ALL of them, and maybe not EXACTLY on time, but close enough). As the saying goes: "The best predictor of the future is the past." 3) My phone now has some feature on it that gives me a weekly report of how many hours a day I average in staring at its little screen. The number is sickening. I hate to even admit it here, but I might as well. For one week, the number was - oh, can I bear to confess this? - THREE HOURS A DAY. Chastened, I did all I could the following week not to reach for the phone, and then learned I had reduced my phone-staring by 30 percent - to a still-staggering two hours a day. It will be a blessing to be FORCED to stop doing this! 4) It will also be a blessing to be forced to be productive even when my granddaughters are here. I will now HAVE to hire nannies sometimes - ooh!!! And I will HAVE to use my downtime to get stuff done rather than, yes, staring at the phone in an exhausted daze. I will have to figure out a way to have work-life balance - and that is a GOOD thing, right? 5) MANY MANY people have VASTLY longer to-do-lists than mine, and they get it all done. One of my writer friends teaches, not one course in a semester, but FIVE - and still writes books - and hosts write-ins at her house - and weaves gorgeous blankets on her loom - and is in a book group, too - and takes long weekly bike rides. If she can do all of that, I can do my piddly stuff. 6) Finally, I'm actually happier when I'm busy. I ADORE getting stuff done. When my boys were little, I'd ask them, "What does Mommy like? and they would give the correct answer: "Progress!" As life coach Martha Beck wrote in a great blog post, "being alive means having things to do." We might as well stop fretting about them and simply start getting them done. I love the season of Advent, the weeks leading up to Christmas. I love organizing our church's Mitten Tree for the homeless and our caroling to shut-ins; I love listening to Handel's Messiah on my car's CD player, and baking my mother's Christmas cookies, and lighting candles in the sanctuary on the holy night of Christmas Eve. And I ADORE being part of an ornament exchange organized for ardent fans of the Betsy-Tacy books of Maud Hart Lovelace, which happen to be my favorite books of all books ever written. In Betsy and Tacy Go Downtown, my favorite title in this favorite series, Betsy, Tacy, and Tib invite their friend Winona to join them in their annual Christmas shopping, where they each bring only a single dime to make a single purchase - of a Christmas ornament. "Nothing," Tacy explains, "is so much like Christmas as a Christmas-tree ornament." 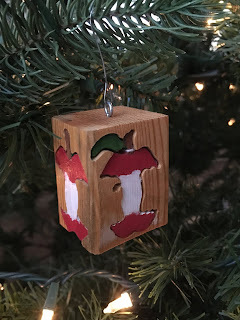 In the Betsy-Tacy ornament exchange, we are each assigned our ornament recipient; then we try to find an ornament that connects in some way with the books and send it to the recipient, but as one of the series characters to another. 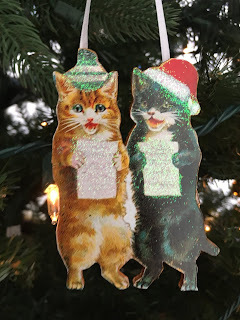 Here are the ornaments I've received in recent years. This one was sent from Betsy to Joe, the boy whom she meets at the start of Heaven to Betsy (as he is eating an apple!) and marries in Betsy's Wedding. 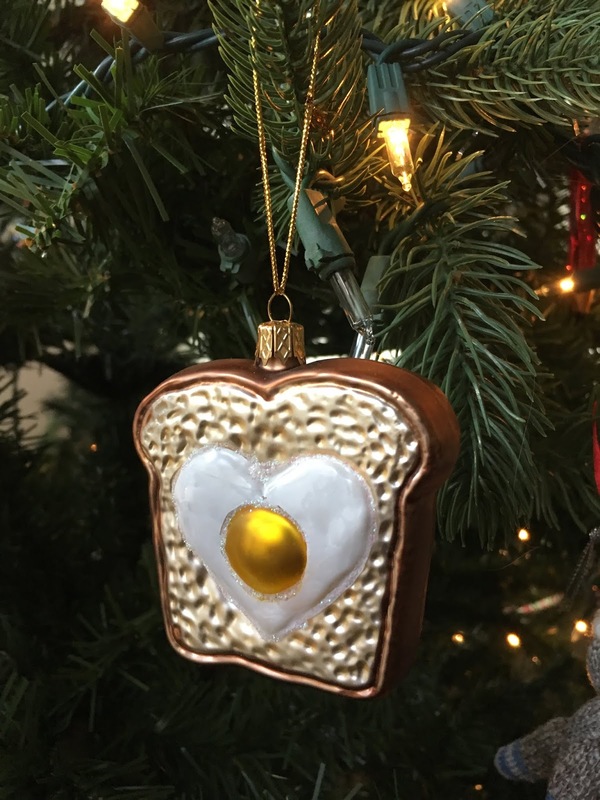 This next one took my breath away because I could hardly believe such a perfect Betsy-Tacy ornament could exist in the world. In Heaven to Betsy, Betsy's friends Cab, Herbert, and Tony make fried egg sandwiches for her family for "Sunday night lunch." Tony asks, "Do you like your eggs flopped or unflopped? Speak quick." 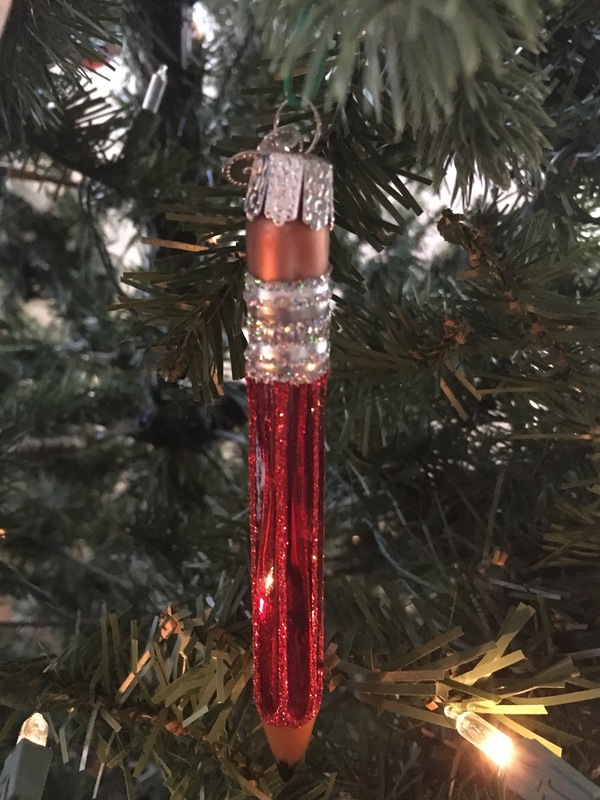 So I was stunned when I opened the package to find this ornament sent by Cab, Herbert, and Tony to Betsy! Allow me to introduce myself. I am Alden Gildersleeve, owner of Queen Quality Shoes. The Queen Quality salesman for the Deep Valley region, Harvey Fangschlyster, tells me your young daughter Betsy intends to be a writer and, to that end, makes use of our promotional notepads. As a man who enjoys the written word, this pleases me and I would like to encourage her literary endeavors. Harvey also told me your amusing story about the holiday shopping Betsy and her friends do each year. I thought I would add to the fun by sending her a pencil to go with those notepads. My best regards to her and, of course, to you, one of my best customers. It is true that nothing is so much like Christmas as a Christmas-tree ornament - especially an ornament sent from one book lover to another. My main goal for the year, as I've announced here, was to have ten hours of creative joy each month, where I'd record these hours in a lovely little Moleskine logbook, with the rule that a log-worthy creative-joy hour had to have something extra: not just ordinary joyous creative work, but work made even more joyful by conscious enhancement of the joy - writing somewhere special, writing with a friend, even lighting a candle at my desk in the dark of the early morning. Until September I met and exceeded this goal every single month, except for one, when I fell short only by half an hour. Not bad! But then in September my life fell apart. And it turns out that you lose interest in strategizing how best to increase creative joy when your life lies in flaming ruins around you. The first half of September was a joy-devoid nightmare. But then came the SCBWI (Society of Children's Book Writers and Illustrators) conference for which I had to: 1) provide five insightful critiques of manuscripts submitted by attendees; 2) deliver an hour-long break-out session on writing the transitional chapter book; and 3) give a closing keynote address on how to live a joyous creative life. I had no choice but do these things, which meant I had no choice but to work for at least ten hours preparing to do them, and then actually doing them. And guess what? 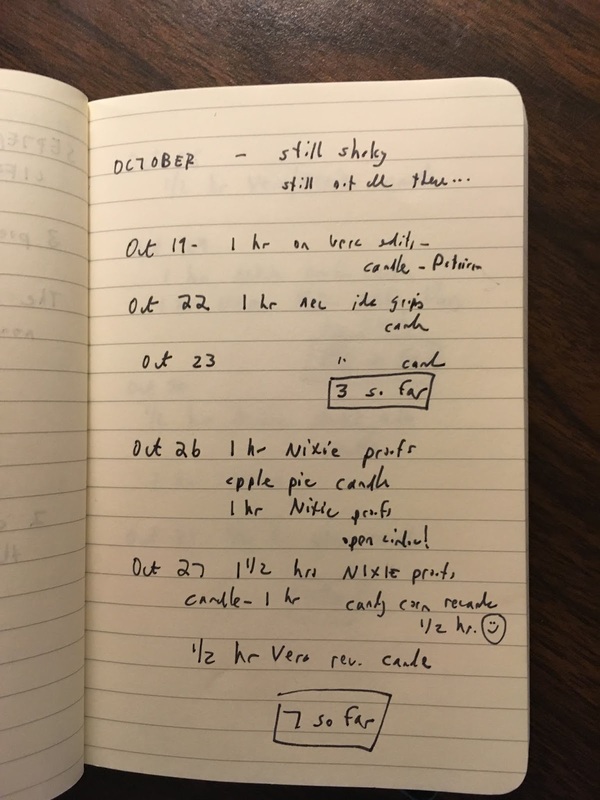 It was SO joyous to be working again at all, at work that I love with my all my heart, that I decided I could write those hours down in the logbook, even if I didn't light a candle while doing them. The first half of October wasn't nightmarish, but it was definitely slothful, as I gave myself credit for merely getting through each day with a modicum of grace and cheer. But then my wonderful editor, Margaret Ferguson, sent me not only the proofs of NIXIE NESS, COOKING STAR (the first book in my forthcoming After-School Superstars chapter book series), but the edited manuscript for VERA VANCE, COMICS STAR (book two in the series). Hooray! More work that I actually had to do! And work I would love doing! So for the past ten days, I've lit my candle each morning and worked through the proofreader's queries on NIXIE and Margaret's editorial suggestions for VERA. Even better, the candles I've been lighting are made by a high school friend of mine who now makes the world's most aromatic and beautiful candles and sells them in an Etsy shop: SoyCandlesbyPatricia. 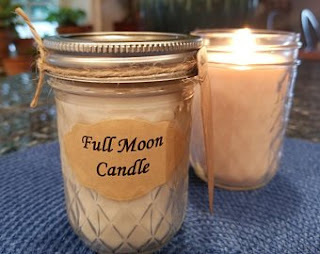 I lit her Full Moon candle on the days leading up to October's full moon and followed Patricia's instructions to set my "positive intentions for the coming month" and "make a wish during the light of the full moon." I'm burning her Hot Apple Pie candle right now - ahhh! My creative joy total for October now stands at 11 1/2 hours. I think my October full moon wish is going to come true because all I wished for was to keep creative joy in my life, even in hard times. In fact, it's come true already. Many of you know that my current life project, in a season of intense dread and despair, is to be a role model . . . to myself. I am trying to show myself how to survive terror and tragedy with courage, grace, and even a measure of good humor. This plan was particularly helpful lately, when I decided that Role Model Claudia had to help Desperately Suffering Claudia face one of her biggest challenges: how not to resent people whose lives are vastly easier than mine right now. Of course, just because someone's life LOOKS easier doesn't mean that it IS. But, actually, I have extremely good evidence that many of these people do have spouses in excellent health, grown children who have brilliant successes and their own flourishing families, all of them close, loving, and by all accounts as happy as happy can be. It's hard not to hate these people sometimes. Or at least: it's tempting to try to avoid spending any time in their company. I find myself wanting to spend time only with other broken people, other hurting people, other people who are stumbling right now in their own dark wood - not people who are gaily scampering through sunlit, flower-strewn meadows. But then Role Model Claudia decided that she had to show Desperately Suffering Claudia how to resist this temptation. I have MANY happy friends. I can't give up ALL of them. And you know what? I love these friends, I really do. And even more important right now, they love me. I can't shut them out of my life. I have to let myself love them, and let them love me. I don't want to turn myself into an embittered person who begrudges joy to others, consumed with envy at their good fortune. That really would be a guaranteed way to create a life that is pinched and shrunken, feeding only upon its own misery. So I've been accepting invitations from happy friends, rather than making up excuses for why now isn't a good time to meet. We've had wonderful, heartfelt conversations about the joys in their lives and the sorrows, too - and the sorrows and joys in mine, as well. I don't NEED to resent other people's joy because - guess what? - I HAVE A JOYFUL LIFE, TOO. I have good health, apple crisp, books to write, books to read, candy corn, walks on crisp October mornings, friends I love, and friends who love me: sad friends, happy friends, sad-and-happy friends. Overwhelmed with Work Projects? Try a Work Smorgasbord! Lately my to-do list has been long, and my energy for tackling it has been low. All of the tasks on the list need to be done, but few of them have a clearly defined deadline, especially one that shrieks out, "DO ME TODAY!" So it's easy to procrastinate, postpone, and otherwise put off any work on these projects, instead filling my days with the soul-sucking alternative of endless Sudoku (my besetting vice), Facebook scrolling, and (worst of all) self-Googling to see if maybe I won some prize somewhere in the last ten minutes I wouldn't otherwise be aware of. Although this may be a by-product of depression, it's also a guaranteed cause of depression, and battling it is, for me, a guaranteed cure (or at least alleviator) of depression. My favorite strategy for defeating this kind of wretched stuckedness is to create a work smorgasbord for myself. It goes like this. 1. Read the proofs for Nixie Ness, Cooking Star. 2. Decide which books I'm going to order for my online course for Hollins University in the spring (this means figuring out the basic structure of the entire course - scary!). 4. Write my Learning Committee report for the church council. 5. Read a friend's book manuscript to give her the critique I promised a month ago. 6. Read the ARC (Advanced Reading Copy) of a book for which I've promised to give a cover blurb. 7. Start a new book! I have to start one sooner or later, or I won't have a next one! 8. Send in the application for the Denver Festival of Stories to be held next March. 9. Read five chapters of Homer's Odyssey for a study group I'm in. 10. Write a blog post. I'm sure there are more things I should be doing, but if I did any of these ten tasks, I'd be better off than I was with NONE of them even faced, let alone finished. Once the list is made, I pick any one of these - any one will do! - and spend one hour doing it. Or part of one hour doing that task, and the other part of the hour doing another one. Any work whatsoever on any goal whatsoever is good enough - is indeed splendid and amazing and totally to be celebrated. That's it: the whole entire work smorgasbord plan. It's as simple as simple can be. But for me, it's magical. I don't worry about picking the most urgent or important task, or the one I'm dreading most. I just pick one, period. Usually I pick the smallest one, or the easiest one - or just the one with the most appeal right this minute. That's not cheating. It's totally allowed. Or so says me, to me. 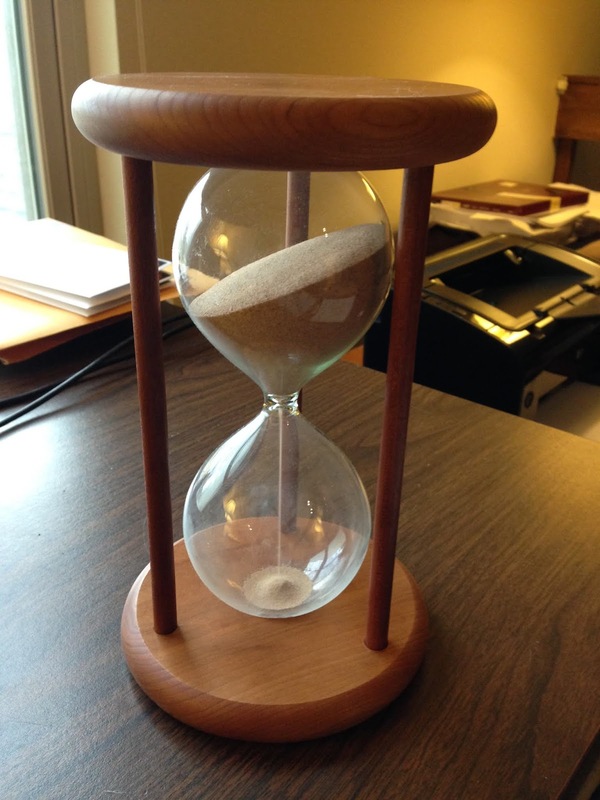 Then I turn over my hourglass and get to work. When the hour is done, I feel so pleased with myself, sometimes I even do - gasp - a second hour! 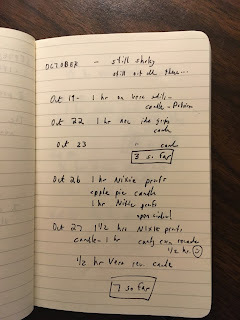 In fact, this afternoon, I accomplished a first reading of the Nixie proofs AND wrote the church council report (only one paragraph, but hey, that's all it needed to be, and now it's done, done, DONE), and in a few minutes this blog post will be done, too. Tomorrow I'll return to the task list and see what I choose for another dedicated hour. Before I know it, I'll have nibbled my way through the whole list. Now that the exhilaration of the SCBWI conference and the Boston excursion are behind me, all that lies ahead is . . . real life. Ordinary everyday life. And ordinary everyday life that is extra-hard for me right now because of family challenges. I'm struggling with what the children in Noel Streatfeild's wonderful novels (Ballet Shoes, Skating Shoes, Dancing Shoes) often call the "Nothing-nice-will-ever-happen-again" feeling. So it is time for me to return to some of my past tried-and-true tips for day-to-day survival. One that worked well for me in years gone by is planning for every day to have in it five episodes of happiness. These can be big or small. There is nothing wrong with small! They can be sources of happiness deliberately added to my day, or things that would have transpired anyway, but now observed and appreciated more fully and mindfully. 1. Lying in bed for an extra ten minutes in the morning, feeling the cool breeze from the open window, snuggling more deeply under my warm covers, allowing my body to awaken, expressing gratitude for its functionality, and anticipating the cup of hot chocolate I'm going to have once I depart from bed. 2. A walk with dog and friend in any weather, with constant expressions of appreciation for how beautiful the mountains are in sun, mist, clouds, rain, snow. 3. Reading a good book before bedtime. It might be a title selected for a book group, or something I need for an academic project, or a new book by an author friend. If I'm especially sad and stressed, it might be a book I've read a dozen times before, where every line is dear and familiar to me. Last night it was The Witch of Blackbird Pond by Elizabeth George Speare. The other two episodes of happiness require some additional effort on my part: doing some work I especially enjoy (writing! 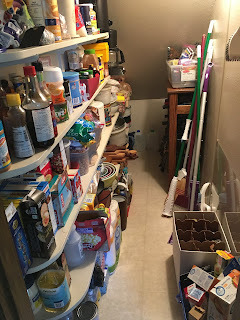 ), lunch with a friend, decluttering a drawer (ooh! ), a phone call to someone I haven't talked to for a while. For today, I have three special things planned: lunch with my beloved church friend Skippy at her elegant retirement-community dining room; baking apple crisp (yum! ); and a meeting of my New Voices book group tonight, where we read books from other cultures and countries (tonight: The Ministry of Utmost Happiness by India's Arundhati Roy). So that makes six episodes of happiness for today, though really just five, because I have to admit I forgot to do the extra bed-snuggling this morning, though I COULD leap back into bed and do it right now. But five is a good number. A day that contains five episodes of happiness is a good day, even if it's a sad day. It's certainly a better day than it would have been otherwise. My older son, Christopher, is our family's expert on extravagant celebration. When he was about to turn 21, he decided that the perfect place to have his first legal drink would be the Waldorf Astoria in New York City, seated next to Cole Porter's piano. I thought this was an excellent plan. So I cancelled class for that day (my students pronounced this the best-reason-ever to cancel a class), and off we flew to New York to accomplish this mission. This month Christopher turned 30. He decided that the perfect way to commemorate this momentous milestone would be to see his beloved Boston Red Sox play their most hated foe, the New York Yankees, at historic Fenway Park. I thought this was an excellent plan, too. So off we flew to Boston this week, met there by my younger son, Gregory, who now lives in Chicago, to explore this storied city together. It was all ridiculously decadent and expensive. And it was all worth every penny. I spent my college years in Boston, so it's a city I love dearly. We walked 25,000 steps (10 miles) the first day, from the famed Citgo sign by Fenway Park all the way to the Bunker Hill Monument, focusing on the Freedom Trail that includes Paul Revere's house, Old South Church ("One if by land, two if by sea"), Old Ironsides, and more. 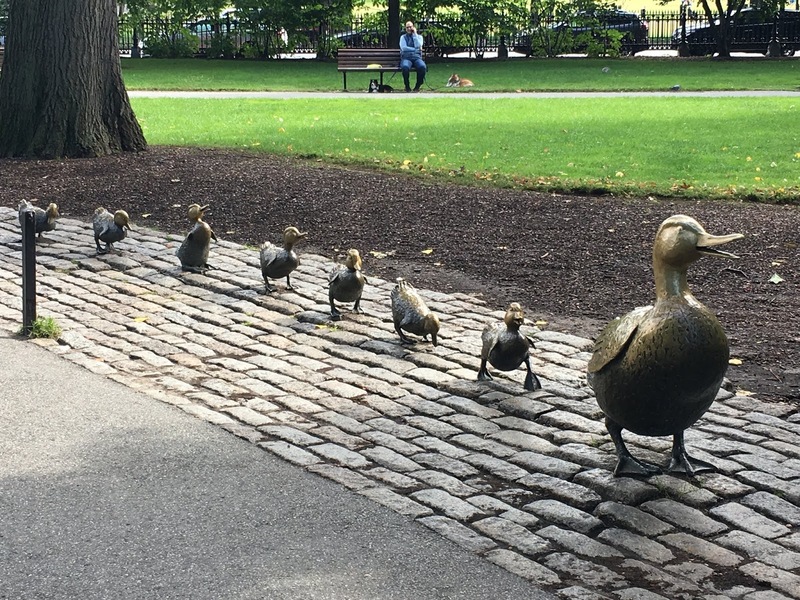 Of course, as a children's book author I had to make a pilgrimage to see the Public Gardens' duck statues in honor of Robert McCloskey's Make Way for Ducklings. 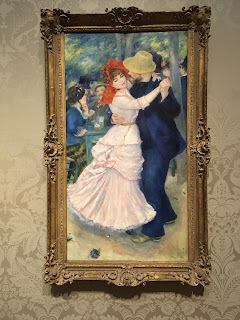 The second day was rainy: the perfect day to visit the Boston Museum of Fine Arts. There I paid homage to Renoir's "Le Bal a Bougival"; a poster of it hung in my Wellesley dorm room through my four years there. 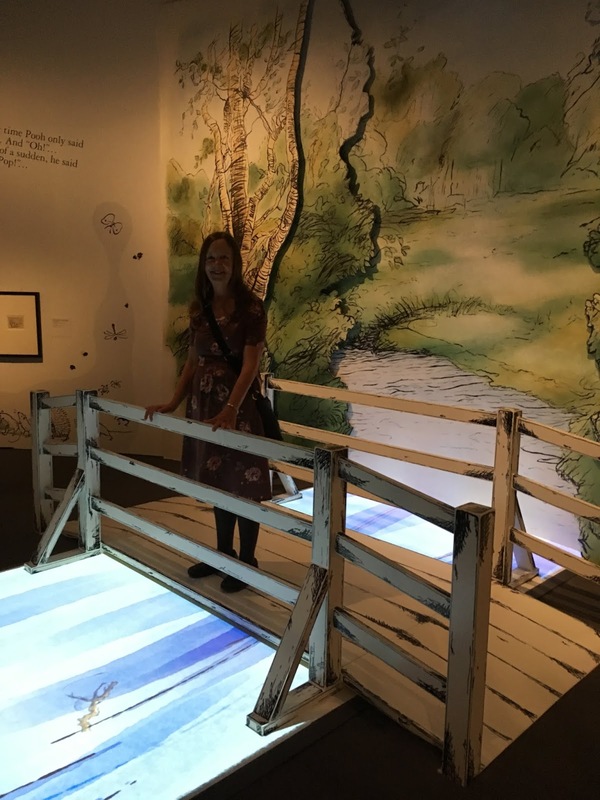 We toured the Winnie-the-Pooh exhibit, where we could walk right into Ernest Shepherd's sketches for his brilliant illustrations. 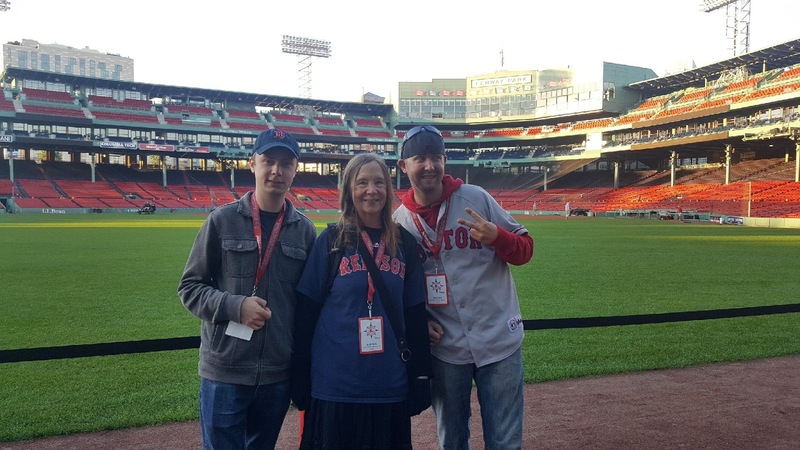 Finally, we spent all day Saturday touring Fenway park, meeting one of the players (Blake Swihart), and watching the Red Sox lose to the Yankees (WAHHHHH!). But nothing could spoil the pleasure of the three of us being able to share that day together. The picture makes me smile in part because I am so NOT a sports fan. 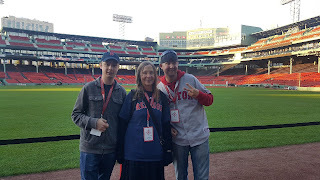 This was the first time in my life I ever wore spirit wear for any team (the T-shirt borrowed from Christopher for the occasion); I had never heard of a single player on the Red Sox team and knew no lore about the team whatsoever (except for the Curse of the Bambino, of course). But it didn't matter. I was there with my boys, and we were having fun. That's all I want any more: just to have little bits of joy, and appreciate them as fully and fiercely as I can while I have them. And that's what I did this week, for three sweet days in Boston. 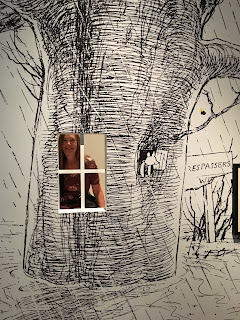 Last weekend was the 42nd annual conference of the Rocky Mountain Chapter of SCBWI (Society of Children's Book Writers and Illustrators), held at the lovely Denver Marriott West hotel in nearby Golden. It was one of the happiest weekends of my life. It was also the most healing. At first I thought it was like getting a massive blood transfusion after the hemorrhage of my recent life. But then I decided it was more like getting a bone marrow transplant of pure unadulterated joy: joy implanted into the very core of who I am. Our co-regional advisers, Kim Tomsic and Jerilyn Patterson, gave me the great gift of inviting me to present not only a break-out session ("Structure and Sparkle: Writing the Transitional Chapter Book") but also the closing keynote address ("How to Have a Wonderful Creative Career in an Hour a Day"). It was bliss to turn from my troubles to talk about what I love best in the world: how to write my favorite kind of book for young readers, and how to live the richest, fullest, happiest creative life. I've given lots of talks in the course of my long career, including lots of inspirational talks, or at least talks I hoped would inspire their audience. But this closing keynote was the one most ripped from my own heart, and so I think it touched the hearts of those present in a different way from anything I've ever done before, or could do again. It was one of those unrepeatable life moments that I will treasure always. My talk, in outline, was pretty simple: 11 tips for a happier creative life. I'll list them here, and they look quite skimpy in their bare-bones formulation, but each one was embroidered with honest confessions, funny anecdotes, and brilliant insights from many other published writers. 1. Little things add up to big things. I shared my hour-a-day writing system and displayed my three hand-crafted wooden hourglasses: one hourglass, one half-hourglass, and one eight-minute hourglass-shaped timer. I quoted Anthony Trollope, as I so often do: "Nothing surely is so potent as a law that may not be disobeyed. It has the force of the water drop that hollows the stone. A small daily task, if it be really daily, will beat the labours of a spasmodic Hercules." "Bite off more than you can chew, and chew it. Plan for more than you can do, and do it. Hitch your wagon to a star, keep your seat . . . and there you are!" I owe everything I've ever achieved in my life to this one, to my ability to keep on cheerfully trudging. 3. Set DELICIOUS goals for yourself: not just goals that are SMART (Specific, Measurable, Actionable, Relevant, and Time-Bound), but goals that will give you a tingle of happiness just thinking about them. I gave as examples my goal for 2017 of submitting something somewhere every single month, and my 2018 goal of having ten hours of creative joy each month. I warned against cutting corners on these goals that matter so much: how could I have let myself be tempted this past summer to cut corners on JOY? 4. Instead, lower your standards for things that don't matter. Here, I confessed how little I care about personal appearance (e.g., I never use a hair dryer: my hair, worn in the same style I've had since high school, can just dry on my head) and housekeeping, plus offered a bunch of practical tips for streamlining tasks at the day job. 5. Even when it comes to things that do matter, our own creative work, don't make it harder than it has to be. I railed against America's culture of overwork, with its constant complaints of busyness that are really just disguised bragging, offering some pointed examples from personal experience. Don't compete for the hard work prize! 6. Don't compete for the misery prize, either. Because here, when you win, you lose. I contrasted two writers with memorable advice for aspiring authors: Annie Dillard (The Writing Life) and Brenda Ueland (If You Want to Write). Annie says writers should be like Seminole alligator wrestlers, grappling with our prey half-naked, risking life and limb, citing the case of one drowned, half-eaten wrestler: "It took the Indians a week to find the man's remains." !!!!! In contrast, Brenda says, "you should feel when writing . . . like a child stringing beads in kindergarten - happy, absorbed, and quietly putting one bead on after another." I choose to take Brenda Ueland for my writing role model, not Annie Dillard. 7. Speaking of competing, use envy as inspiration. My mantra: don't envy, emulate. I don't envy others' achievements (well, of course I do, but I try not to); these may have been purchased at a price I'm not willing to pay. Instead, I keep a list of people whose whole lives are worthy of my envy: lives lived every day with creative joy. If we compete to have the happiest, healthiest, sanest, most joy-filled life, and we win (or even just benefit from the striving), that's a prize worth having. 8. Document and celebrate achievements. 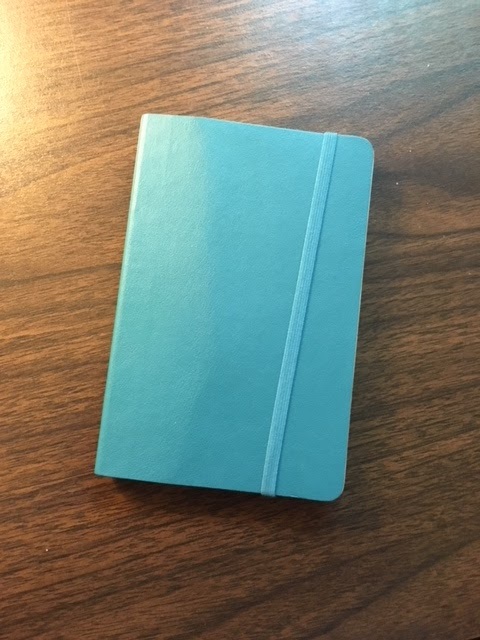 I showed my beloved little notebook, where I keep a list of each month's "Nice Things and Accomplishments." 9. Be careful what stories you tell yourself. Some examples of favorite stories I tell myself, about myself, are "I'm never sick" and "My planes are always on time" (both true - except when they aren't). I shared other pages from the beloved little notebook where I face my problems head on, scribbling thoughts to myself on the page, usually discovering that things really are going to be all right, or at least reasonably okay. I'm a master of avoiding wallowing through stern - but loving - self-talk. 10. Give yourself permission to be happy - and to admit that you are. Robert Louis Stevenson wrote, "There is no duty we so much underrate as the duty of being happy. By being happy we sow anonymous benefits upon the world." 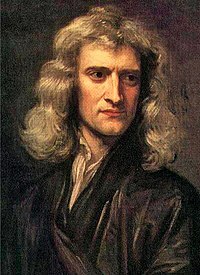 He is also the one who wrote, "The world is so full of a number of things/ I'm sure we should all be as happy as kings." AND: being happy does NOT mean having a life that is easy or pain-free. I quoted the beautiful ending of The Great Gilly Hopkins by Katherine Paterson, when Trotter tells Gilly, "Life ain't supposed to be nothing, 'cept maybe tough," and Gilly says, "If life is so bad, how come you're so happy?" Trotter replies, "Did I say bad? I said it was tough." Yes, yes, yes, yes, YES! 11. Finally, give generously and receive gratefully. I've never not responded to someone who sought my advice on how to write a children's book, and I've met so many wonderful people as a result. Only once did I blow someone off, ten years ago, when I gave another, similar SCBWI talk and someone contacted me afterward to ask if I would be her mentor. My life was in flaming ruins at that time as well, so I just couldn't take on another thing. But she persevered, emailing me a second time, and this time it was easier just to meet with her than to think of a reason to say no. So I did, and - of course! - she became one of my life's dearest friends, who is now serving as my "raft buddy" (her words) as we both try to stay afloat on our current stormy seas. Giving IS receiving. They are one and the same. And SCBWI itself is a model of how much we all gain from fostering a thriving writing community together. That was my talk. I gave it from my heart, and the ballroom full of attendees gave me a standing ovation in return. I can die happy now, except that I'd rather go on living, even if life ain't nothing but tough. As I reminded myself last weekend, a tough life can still be a joyful one. It's been a week since I made the decision to face the saddest, scariest season of my life by trying to be a role model. . . to myself. I made a commitment to showing myself how to endure the unendurable with grace, courage, kindness, and even some good humor, too. I liked this plan! But now I have to report that so far I've been only a minimally adequate role model, if that. There's too much pain. There's too much fear. It's hard to eat, to sleep, to remember the things in life that used to make me happy. Oh, role model, where are you? Somebody is going to have to step up her game, and preferably sooner rather than later. Where I've most failed is in accepting help offered by loving friends. I don't know why I can't seem to do this. I've accepted love, and emotional support, and prayers - oodles of prayers - but I can't seem to make myself accept concrete offers of specific, tangible assistance. Three different beloved friends have offered to bring meals, and meals are actually what I need most, as I hate to cook, am a terrible cook, and find even the thought of cooking right now beyond what I can fathom. Yet instead of saying, "Oh, would you? could you? that would mean so much to me!" I said, "Oh, we're fine." I think I just felt it was too pathetic to admit that I can't even fix a meal right now. But the truth is that I can't. I've also failed at avoiding apocalyptic thinking. When friends try to offer reassurance that someday, in some way, all will be well, I find myself compelled to rebut their comfort by showing them all the ways in which NOTHING WILL EVER BE ALL RIGHT EVER AGAIN. So far, here's what's helped most. Several friends sent me "thinking of you" cards in the mail, which I cherish. One friend's husband is coming today to install grab bars in both bathrooms to help make my little house more handicap-accessible (I didn't have any problem admitting I could never install a grab bar myself in a million years). 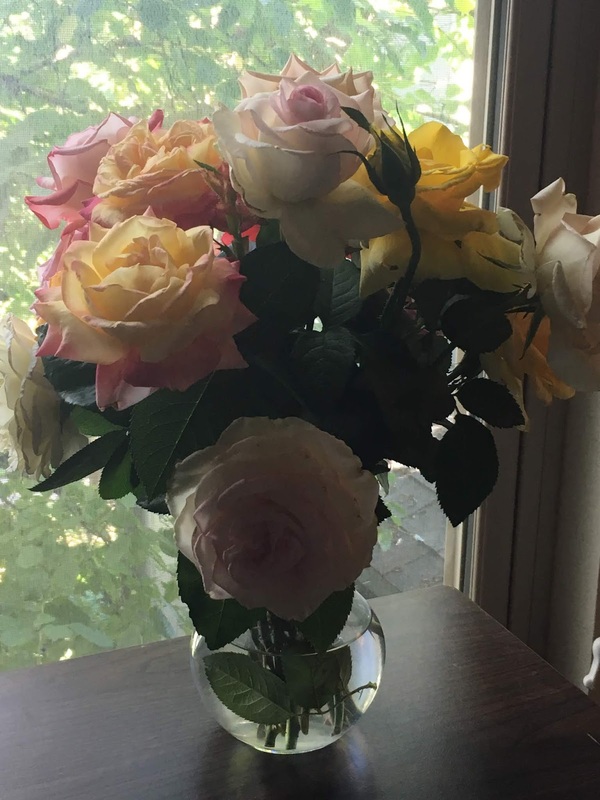 A church friend sent home with me on Sunday the gorgeous roses in full bloom she had provided for the altar. 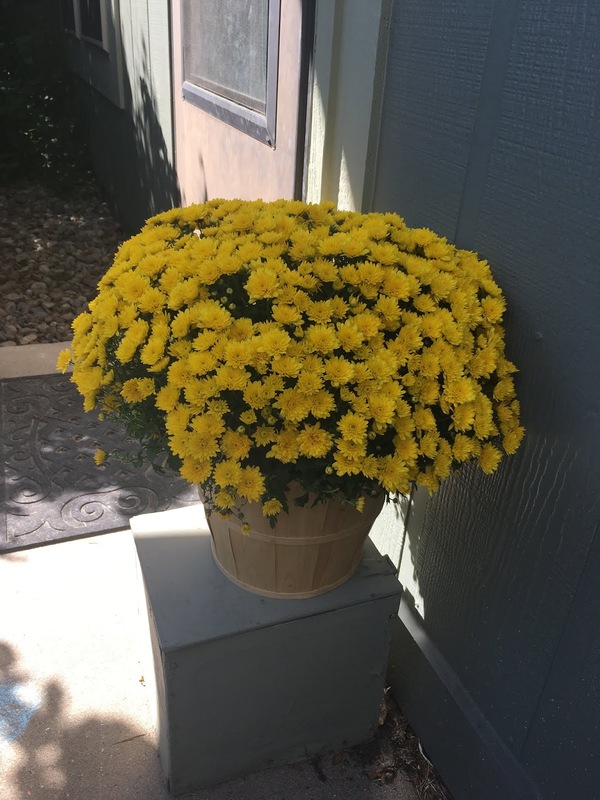 Some friend who didn't identify herself left a bright yellow chrysanthemum outside my front door. Every time I inhale the scent of the roses, and see the cheery blossoms on the mums, I feel surrounded by love- and maybe even some hope, too. Yet what helped me most this past week might be something I did for myself. I took off the full day Friday from pain and grief and did nothing all day - nothing at all - but luxuriate in re-reading Jane Eyre, a book I last read in college. I read five hundred pages in a single day, read till my eyeballs burned, then crawled into bed exhausted only to get up a few hours later and return to the couch to finish it. It's so good! So romantic, and lurid, and melodramatic, and brilliantly observed. I didn't read it for illuminating truths about the human condition, but simply to escape into the world of Jane and Mr. Rochester, to be utterly lost in an all-consuming story. Yay for friends - and for flowers - and for books. On Friday, for that one day, I was an excellent role model for myself. I have to give myself - and Charlotte Bronte - credit where credit is due. I am in the midst of what might be the saddest season of my life so far, dealing with crises of staggering proportions for two family members, with new daily terrors facing me as the one who is charged with Figuring Everything Out: choosing lawyers, choosing rehab facilities, finding the extravagant sums of money needed to pay for it all. I've been tempted to wallow - indeed, I've felt downright entitled to wallow. Ecclesiastes tells us, "To everything there is a season, and a time for every purpose under heaven." Right now my time to weep and time to mourn seems also an excellent time for wallowing. Except that while I do need to weep and I do need to mourn, wallowing really doesn't seem to be the world's most satisfying activity. So instead I decided to give myself a project (oh, how I love projects). What if I try to face these challenges with as much grace, dignity, kindness, and good humor as possible? What if I set myself the task of becoming a role model - not to others, I don't have the hubris to attempt that - but to . . . myself? I want to amaze myself by having a good, rich, full happy life anyway. I want to be able to look at myself and say, "Wow! I can't believe Claudia can be so wise and kind and funny and productive given all she is going through!" I'm lost in the dark wood. I want to be the one to show myself the path out of the forest. So of course I made some lists. 1. Breathe. This has already proven so helpful! 2. Keep on walking 10,000 steps a day - ditto! 3. Be kind to everyone involved. 4. Give yourself as much help as you can: medication, therapy, love and support from friends. If anyone offers any assistance whatsoever, say, "Yes, thank you!" 5. Avoid apocalyptic thinking. Do NOT assume your life is over. Do not assume your family can never recover from this. Remember that you know NOTHING of what is going to happen, because, to quote a famous physicist, "Prediction is difficult, especially about the future." Repeat these words hourly: "You know nothing. Anything can happen. You know nothing. Anything can happen." ALL I know is that it's going be hard, but I'm good at doing hard things. I've had plenty of experience. 6. Get some actual work done this month, too. Philosopher/theologian Miguel de Unamuno has told us, "Work is the only practical consolation for having been born." I'm going to try to do a stunning, rabble-rousing job as a closing keynote speaker at this month's Society of Children's Book Writers and Illustrators conference - where my subject is (ironically? appropriately? ): living a creative life of joy. 7. Listen as needed to this recording of the gospel song "I Still Have Joy." 8. Pray. Pray some more. That's the plan. There have already been a few wobbles along the way. But it's a good plan. I hope Claudia can help Claudia out of this mess. I'm rooting for her, and for me, and for all of us. Do. Or Do Not. There Is No Dither. I have repurposed Yoda's famous words for myself because I truly think I waste more time with dithering than with anything else. I am the queen of dithering: of hesitating, wavering, faltering, vacillating. Never do I dither because I truly don't know what to do. I dither because I know exactly what I'm going to do but can't quite own up to the fact that I've already made my decision. Here's the most recent case in point. 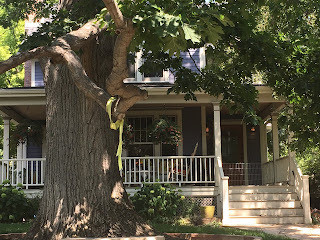 I finished up July ("The Week of Fixing Everything") with completing a full draft of a third-grade-level chapter book for my publisher, Holiday House. I then sent it to three writer friends for their comments, so I could get it in the best possible shape before sending it off to my editor in New York. I received their comments within a week, so all I had to do was sit down and make the needed revisions. Two of the friends basically loved the book and offered only a few, narrowly focused suggestions. There was too much backstory in Chapter One (note: the opening chapter "info dump" is the most classic of all beginner's errors, here made by me in what will be my 59th published book!). One scene felt obviously dropped into the book as a setup for a subsequent more crucial scene: could I find a way to layer in the setup more naturally? Alterations in the logistics of one story line would make for a simpler narrative, with more dramatic tension to boot. It would be a piece of cake to fix all of these. The third friend, however, basically didn't love the book. She wanted higher stakes from the start and a much bigger payoff at the finish, with maybe an entirely different problem for the main character, Vera, to be wrestling with throughout. Now, I knew I wasn't going to change my book so radically. I just wasn't going to do it. I LOVE writing books with low stakes (but which feel so important to the children facing them); I LOVE writing books that end with one small step taken forward, one tiny moment of growth. This, I would say, is the very hallmark of what I consider a "Claudia Mills book." So I could have just ignored this set of comments and moved on. COULD I raise the stakes? SHOULD the story have a bigger, bolder resolution? Should I tear it up and write a different book altogether? Remember: I already knew I was going to answer each of these questions with a no. But I felt guilty about ignoring comments from a writer (and dear friend) I do respect, who had given considerable time and energy to critiquing my book. Finally two days ago, with the end-of-the-month looming, a month quite devoid of things to add to my monthly list of "Accomplishments and Nice Things," I declared an end to the dithering and did exactly what I knew I would do all along. I trotted off to the computer, revised the book (in three hours!) from the first two sets of comments, and (not without a pang) largely ignored the third (though making a few small but significant changes because of it). I emailed the book to my editor yesterday morning and added "revised and sent off the Vera book" to August's "Accomplishments and Nice Things" list. Maybe some dithering is a necessary part of the writing process - and of the living process, too. But here two days of dithering would have been adequate. Two weeks of dithering bordered on ridiculous. Oh, Yoda, I should have listened to you sooner: "Do. Or Do Not." There is no dither! Today is my birthday. All year long my high school friends have been turning 64 and posting links to the Beatles singing, "Will you still need me, will you still feed me, when I'm 64?" 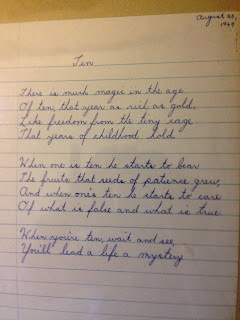 For those who can no longer read cursive (and I can't believe how beautifully I could write it all those years ago! ), here's what I wrote on August 20, 1964. 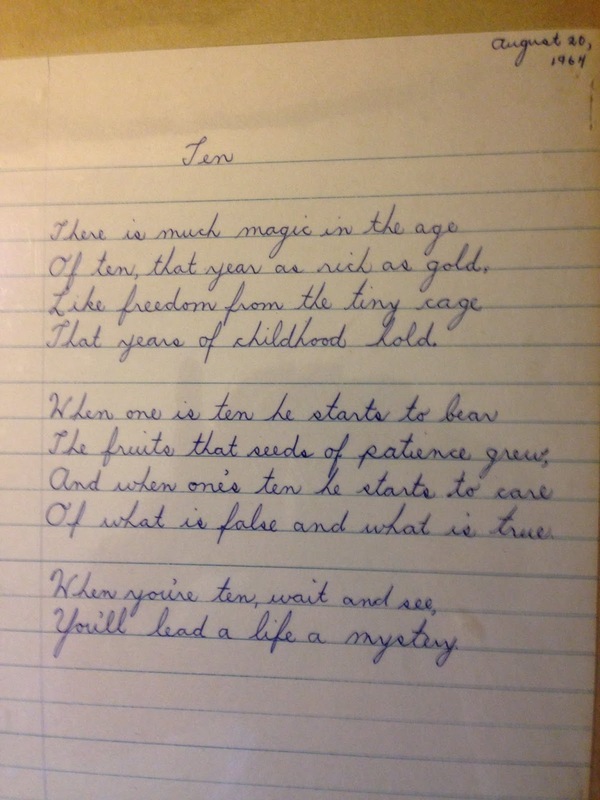 Of ten, that year as rich as gold. That years of childhood hold. The fruits that seeds of patience grew. Of what is false and what is true. You'll lead a life of mystery. Well, I don't remember bearing any fruits that seeds of patience grew. I do remember caring of what is false and what is true: that was the year I felt betrayed by someone I thought was my best friend who - gasp! - turned out to like another friend more than she liked me. What is most true is that I did end up leading a life of mystery. So many things happened in my life that I could never have predicted. In two ways my life turned out exactly as I expected: I knew I would be a writer, and a writer I became; I knew friendship would be extremely important throughout my life, and it has proved my life's greatest joy. But I didn't know that I'd ever get married (another poem of this era begins, "I hate boys/ I'll say it twice /I don't think boys/Are very nice"). I didn't know that I'd become the mother of two boys and move to Colorado to live at the foothills of the Rockies. I didn't know how hard marriage and motherhood would be for me. I didn't know how many mistakes I'd make (I should have planted more seeds of patience!). I didn't know how much life would demand of me that I wasn't ready to give. But here I am. I'm going to have breakfast with my dear friend Rowan this morning, and then work on revisions for an academic children's literature article and for a third-grade-level chapter book. Tonight I'll attend a friend's book launch at the Boulder Bookstore and go out to celebrate both her book and my birthday afterward. If I ever write a memoir, I think the title might be Despite Everything. That's the main thing I didn't know: how much hard stuff there would be - and how good my life would be, anyway. I grew up loving the Mrs. Piggle-Wiggle books of the irrepressible Betty MacDonald, where in each chapter Mrs. Piggle-Wiggle has a magical cure for some child's comically bad behavior: "The Slow-Eater-Tiny-Bite-Taker Cure," "The Thought-You-Saiders Cure," "The Answer-Backer Cure," "The Fighter-Quarrelers Cure," etc. 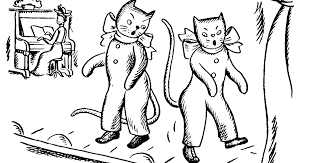 I published a scholarly paper on the Mrs. Piggle-Wiggle books almost twenty years ago: "'Powders and Pills to Help Cure Children's Bad Habits': The Medicalization of Misbehavior in Mrs. Piggle-Wiggle," Children's Literature Association Quarterly, vol. 26, no. 4 (Winter 2001-2002). In the course of writing that paper I had occasion to read her four memoirs including The Egg and I (1945), which sold a million copies in its first year of publication. I had read somewhere that Betty MacDonald was born in Boulder, but I never got around to hunting for her birthplace. Then this month I read Paula Becker's Looking for Betty MacDonald, both a biography of MacDonald and a memoir of Becker's personal journey to discover the woman behind the books - and the many homes she inhabited, with a helpful list provided of all the addresses. 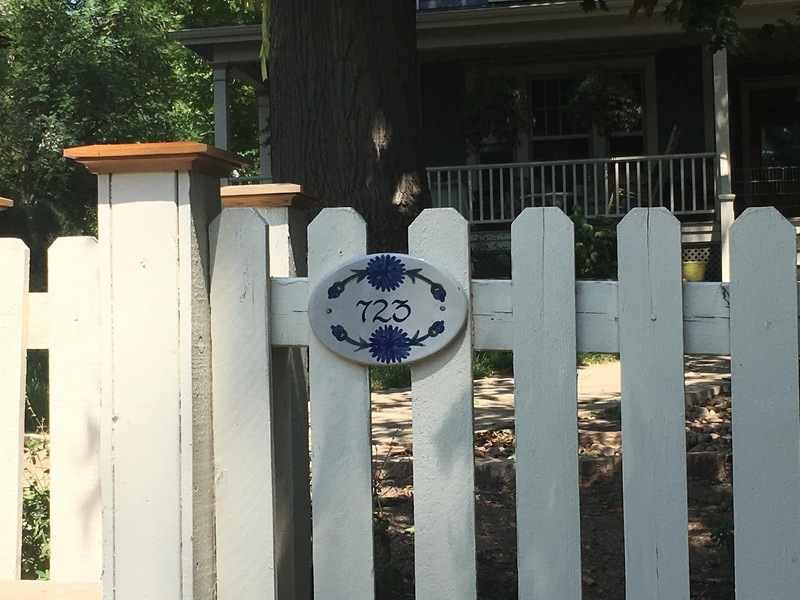 The house Betty was born in was 723 Spruce Street (formerly 725 but subsequently renumbered). So off I went yesterday to find it, and there it was! 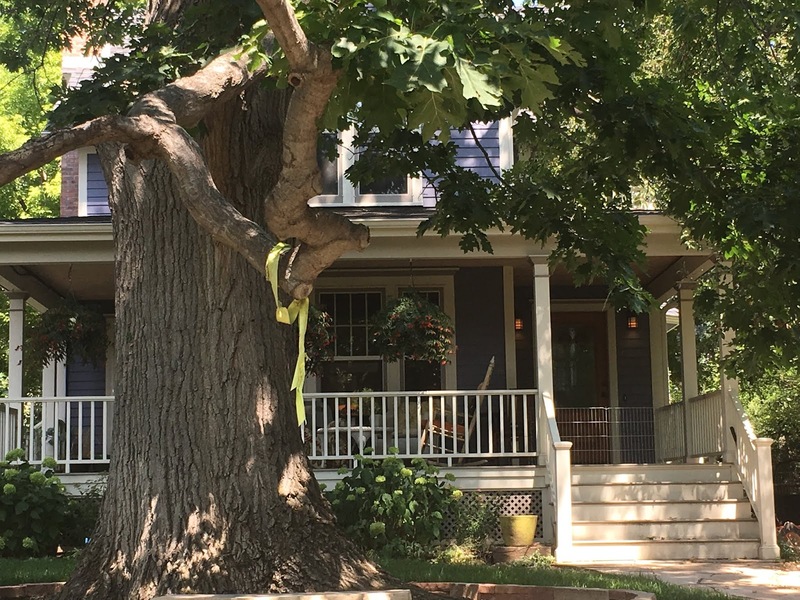 This is the house where Betty made her way into the world on March 26, 1907. Her grandmother, Gammy, summoned a neighboring vet to help but (quoting Becker), Betty's mother "sent the vet home" and "cut and tied the umbilical cord herself." It was of this house that Betty later wrote, "When I was a few months old, Mother received the following wire from Daddy [a mining engineer]: 'Leaving for Mexico City for two years Thursday - be ready if you want to come along.'" And her mother was, so off went baby to Mexico, ending her residence in Colorado. I was a bit worried that the house doesn't look at all like the period photo in Becker's book, so I went to the Carnegie Library for Local History website and found a "building inventory" of the site which noted that "the exterior has been significantly altered." The Carnegie Library website gives as the "statement of significance" for the building that it is "associated with Professor J. Alden Smith," a prominent geologist and metallurgist. But - but - what about Betty MacDonald?!!!! A prominent children's book author and humorist?! Who is surely a hundred times more noteworthy, at least for me, than Prof. J. Alden Smith! Part of me wants to contact the Carnegie Library for Local History to protest this oversight. But I'm not one for protesting things, generally, and it's fine if pilgrimage requires a bit of camaraderie on the part of the pilgrims. Paula Becker found Betty, and then she helped me find Betty, and now, fellow Boulderites or visitors to Boulder, I'm helping you. And if you don't know Mrs. Piggle-Wiggle, now is a wonderful time to check these books out of the library and curl up for a treat. Most of my writer friends say revision is their favorite part of the writing process. What they dread is that initial, terrifying blank page/screen. Once they force themselves to finish a first draft, then the fun part of writing can begin. I LOVE the blank page, with its pure possibility. I love how low the stakes are for a first draft because, hey, all of this can be changed! all of these problems can be fixed! After all, as author Jane Smiley says, "Every first draft is perfect, because all a first draft has to do is exist." I love the physical act of writing the first draft: for my creative work, I write my drafts longhand, lying on the couch, with a favorite pen on a favorite pad of paper on a favorite clipboard. I love writing a page every day and having such clear, tangible evidence of what I've accomplished. There it is, one more page, written by me. When it comes to revision, now I really have to work on a computer. And a revision has to do more than merely exist: ideally, it should be better than the first draft. (One of my bugaboos as a writing mentor is when my mentees do revisions - against my advice - that make their books worse.) There has to be progress, and it's hard to see the progress; it's not easily measurable in terms of word count or growing stack of pages. Now I don't have have the luxury of turning off my editor brain and silencing my inner critic. Indeed, now I have outer critics: writer friends, or double-blind reviewers from academic journals, or editors at my publishers, who have given me a most distressingly thorough list of things they want fixed. So many things! Some of which are so hard to fix! I'm going to tackle the article revisions first, as those are woefully overdue (the book isn't due to my editor until some time in September, and I might as well wait until I have the comments from the last two reviewers). I sat down and read the article again and loved it, which was encouraging. Then I sat down and read the reviewers' comments again and was discouraged all over again. But much as I'd like to wallow in discouragement, that isn't helpful at this point. 1. Acknowledge the broader context within which my discussion is situated. (NOTE: don't write a whole new paper about this broader context! Just write a short paragraph acknowledging that it exists!). 2. Account for the lengthy chronological gap between the earliest texts I discuss and the most recent ones. (Again, this involves mainly acknowledging the gap and venturing an explanation for why it exists). 4. Motivate the selection of these three texts more fully (i.e., show that they are not just three books I happen to have read and liked, which of course they are). 5. Tap into the larger conversation set forward in a certain scholarly book (which I did buy, and read, and ponder). 7. Cite several more scholarly articles from the secondary literature suggested by the reviewers (note to self: but don't position citations from these as conclusions!). And five MORE things too complicated to distill here. Oh, can I do this? What if I can't? HELP! HELP! HELP! All I can do is try. If I were a betting woman, I would say there is a 70 percent likelihood of my improving this paper enough to get a grudging blessing from the reviewers, and a 30 percent chance of failure. Those are fairly decent odds. In the past, I've been equally discouraged and ended up with a published article; in fact, only once in my entire double career as philosophy scholar and children's literature scholar have I failed to please the reviewers after making my best effort at revision. And if I don't do these revisions, I have ZERO chance of acceptance. Wish me luck, dear friends!